Wow! Didn’t see this coming! Yesterday DC Comics announced a new weekly series starting in Spring 2014 entitled, The New 52: Futures End. The big news for Match-heads is that Firestorm will play an important role in the series!! The story broke via the Associated Press early Wednesday morning. I’ll give a quick rundown of the details here… The New 52: Futures End debuts on Free Comic Book Day in May 2014 with a free zero issue, then issue #1 will follow later that month. The writers on the series include: Jeff Lemire, Keith Giffen, Brian Azzarello and Dan Jurgens. Some of the artists on the series include: Ethan Van Sciver (drawing the zero issue), Jesus Merino, Aaron Lopresti, Dan Jurgens, and more. That’s right, Dan Jurgens and Ethan Van Sciver will be working on Firestorm again! Add the star power of the other creators involved and it sounds like the Nuclear Man couldn’t be in better hands! Back in 2010 Firestorm was featured in a similarly structured bi-weekly series entitled, Brightest Day. That series did a tremendous job raising the profile of the character, resulting in his own monthly series. Fingers crossed for similar results this time around!! Very little information is available on the series at this time, especially Firestorm’s involvement. Below is an excerpt from the AP story, including mention of Firestorm. [Jeff] Lemire calls the new weekly series an exploration of DC’s past, present and its future. Lots of chatter among the fans about Batman Beyond and Frankenstein, but for obvious reasons I’m focusing on Firestorm here. One question that comes to mind is which incarnation of Firestorm will we see in this series? Will it be the current Ronnie/Jason version? Or will Forever Evil result in a change to the current Firestorm matrix composition? When I read the description, I assumed Futures End would be somewhat like an anthology. Three features with independent creative teams, telling segments that weave into an overall story; one each for past, present, and future. On Facebook I asked Dan Jurgens, “Can you tell us which segments you’ll be most involved in? Will you be writing/drawing the Firestorm segments?” Ethan Van Sciver followed up with, “There aren’t ‘segments’, it’s a story.” Very cool! Maybe Firestorm will meet Batman Beyond. That would be pretty sweet! Below you’ll find the cover of The New 52: Futures End #0 by Ryan Sook. 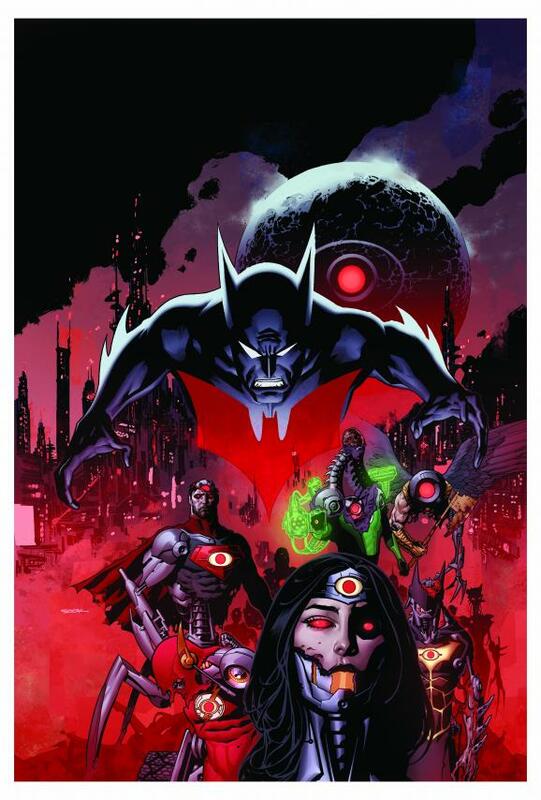 Looks like Batman Beyond will be dealing with some Brother Eye/OMAC future folk! Good luck, Terry! Support Firestorm (and Futures End)! Fan the Flame! Posted in: Comic books, Dan Jurgens, Ethan Van Sciver, Firestorm #10: New 52 v2 (Ronnie/Jason), Futures End, News. ← Killer Frost & Sterling Gates… together again in Forever Evil: A.R.G.U.S. I must not have woken up yet. There is no way that book can be real. McGinnis, Firestorm, and Franky? Ha, good try dream, I’m on to you. This is awesome news for Firestorm Fans, indeed. I’m sure Batman Beyond is the headlining act for this series, because y’know…Batman…but combine Firestorm’s proximity to that with the weekly release which will generate a strong look-in audience if nothing else and this could raise Firestorm’s profile to its highest level since the Super Friends. I talked to Ethan Van Sciver at Granite State ComicCon a couple months ago. He told me he was going to start drawing the FCBD issue for DC the very next day, and that it was the prologue to next summer’s event. Of course, he couldn’t give any other details at the time. Regardless, good news for you, Shag!